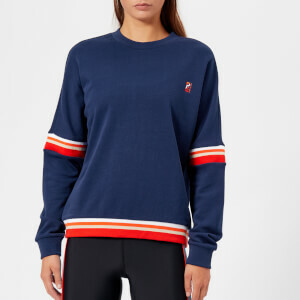 Women’s ‘Bardot’ sweatshirt from activewear brand, The Upside. Cut from a soft stretch jersey, the navy sweater features a round neckline, dropped shoulders and ribbed trims at the collar, cuffs and hem. The structure boasts a lace-up back comprising ribbons of logo tape threaded through metal eyelets. Further logo tape decorates the sleeves to complete the design.